Life With The Speeds: Roll Up! Roll Up! There's a Swashbuckling Circus Ahoy! Roll Up! Roll Up! There's a Swashbuckling Circus Ahoy! We are so lucky to have the historical Hippodrome Circus local to us and on Sunday 17th April we were fortunate to be able to go to the final performance of their Easter "Pirate's Live" circus, which ran from 25th March to 17th April. 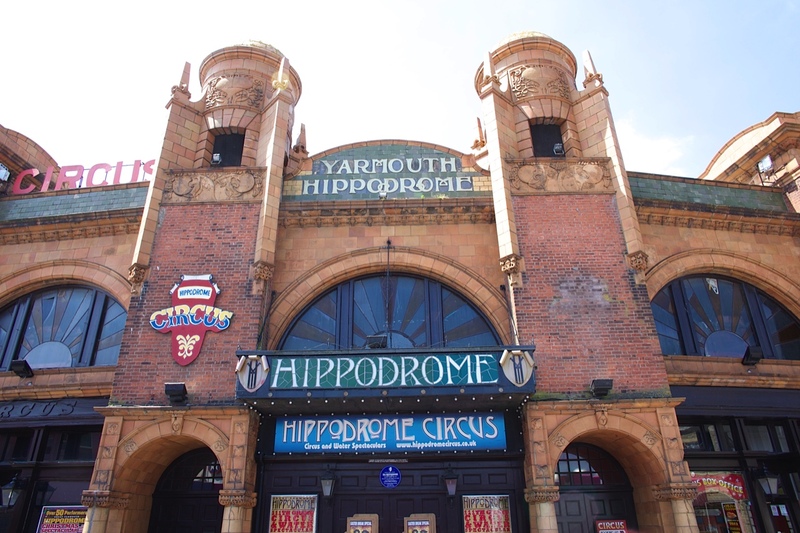 The Hippodrome was built in 1903 by George Gilbert, legendary Circus showman and is Britain's ONLY surviving total circus building. It is situated on St George's Road, running parallel to Marine Parade, just behind the Flamingo and Circus Circus (surprise!) arcades. The building is striking, with original features inside and out, stain glass leaded windows and domed turrets stand high above you as you enter the building. The circus is owned and run by the Jay family and Jack Jay stars as one of the main characters in the Pirates Live show, alongside hysterically funny Johnny Mac! As you enter the Hippodrome through the wooden doors at the front of the building you enter into a small lobby area which filters you through past refreshment stalls on either side, these sell an array of drinks and sweet treats to tempt you as well as light up swords and flashing wands which are always popular with children. Prices are reasonable and what you would expect to pay whilst watching a show. Upstairs there is also a licensed bar. We ushered the girls through and turned left to use the toilets before the show. As you enter the ladies toilets you notice the use of reds and golds, traditional colours in circuses and the walls and doors are covered in printed circus posters from over the years. These caused a long discussion with the girls as they are always fascinated by the animals in the posters and I enjoyed reminiscing about the tigers and monkeys I saw as a child in this very circus. Of course, these are no longer used in shows today but it did bring back memories of visiting there with my grandfather. 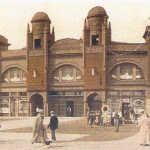 The circus has a museum which you access via the backstage area and is housed in the old performing animal quarters (the smell is definitely still there!) There is a small additional cost for this. 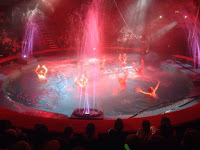 The Hippodrome also boasts of their unique water spectacular which sees the floor dropping to reveal a pool in which synchronised swimmers perform. There are only 3 of these water features worldwide! This is the third year that Pirate's has returns to the Hippodrome and it has been a hit each year, with fun and excitement, and every year adding a different spin on the storyline. We returned to the main foyer and went through to the ring. As you go through you see the circle of seating spreading out either of side you and encompassing the ring, The seating goes up steeply which makes viewing clear from all rows and everyone gets to enjoy a great show. For Pirates Live the ring is staged with the drop floor down creating a lagoon, edged with decking and at the back a large replica of a pirate ship. Behind the obvious chlorine smell I am sure I could still detect a hint of the circus from my younger days; the animals, just a yearning memory perhaps but it always makes me smile. The show started and it followed a simple storyline of "Good Pirate" Captain Jack Hawkeye and funny but ever the calamity Pirate Johnny who find themselves up against Jack's long lost brother, the "Bad Pirate" Captain Blackheart with his band of villainous pirates! Blackheart is seeking out the towns Fountain of Youth and Jack and Johnny must do everything they can to stop him. The traditional African Acrobats added an energetic and fun element and this quartet performed limbo under fire, somersaults and balancing acrobatics. Gymnast enthusiast Emily especially enjoyed the balancing and aerial acts and some parts she was actually holding her breath! Whilst Chris and Mollie's favourite part was the "Rum Rhyme" skit. They just couldn't stop laughing! The story (like all the best ones) ends with Blackheart getting his comeuppance and being made to walk the plank! And lots of cheers from the audience. After the finale of music and dance with the entire cast of performers (cue lots of hand clapping in time to the music which always gives a great feeling to the end of a live performance) the children were invited down to the ring to meet Captain Jack and Pirate Johnny and to snap a photo with them. Our two were keen to get down there and happily posed "Arrrgh!" VIP access – no Queuing! With tickets (see prices here by clicking on the link then scrolling down to prices) available to book NOW we cannot wait. Mollie just happened to notice that the show starts on 13th July (her 10th birthday!!!!! So she's now dropping hints for us to go) and it runs through till 18th September. To find out more information visit their website or checkout their facebook page. Thanks to the Hippodrome for great entertainment and a laughter filled evening.